← OLD SCHOOL: Jack Hassler Co., Inc., Founded 1900, Union Shop. Lighting is the Word in Lighting Restoration: Lighting Technologies Create New Issues for the Historic Project. LAMP BACKWARDS STORY TELLS. A 1930 bronze fixture at the Westchester County Building reveals its layered history, peeling brown paint and, visible beneath, a heavy coat of verdigris, neither matching the intent of the designer. Verdigris is a natural buildup of oxides while the paint remains from a crude attempt to suppress oxidation and to approximate the original finish. That finish, “antiqued” bronze, was discovered on an unexposed surface. 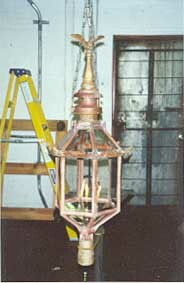 It will be recreated using the original technique, torch applied hot-patination, and further oxidation prevented by a coat of clear lacquer. Lighting fixtures distinguish themselves from other building fabric by delivering a commodity much affected by changes in taste and new technology. By understanding how the client’s expectations of lighting performance may have evolved, a durable specification can be developed, one that will survive the project intact and continue to serve the client for years to come. This is restoration, after all, and the goal is to develop solutions that can endure right along with the historic fabric of which they are a part. Appetite for light in public places has grown and so has the number of technologies capable of delivering it in an acceptable form. The historic lighting artisan can aspire not just to restoration, the mere recovery of what was, but to better delivery of natural looking, energy efficient light. In so doing, however, a number of constituencies are encountered which may be unfamiliar to most restoration professionals. Lighting choices have consequences that affect security, energy costs, purchasing inventory and maintenance costs. It is not always possible to please everybody, but the time to try is at the beginning of the project, during the design phase. New technologies can offer compelling benefits but a light source upgrade is rarely simply a matter of swapping parts. Dawn Ladd, owner of Aurora Lampworks, a lighting restoration specialist from Brooklyn, NY, observes that designing upgrades to historic lighting fixtures is done backwards from how fixture design is generally taught and practiced. It is most efficient to start with the light source and design the fixture around its requirements, but the lighting restoration professional must do the reverse, transforming the existing fixture into a suitable platform for new expectations and new technology. As an example, she cites a current project, ten bronze deco exterior fixtures at the 1930’s Westchester County Office Building in White Plains. Evaluated by a conservator (see photo caption), recreation of their original antique bronze finish has been specified. It is possible that the existing light source, incandescent, will be reproduced as well because incandescent furnishes a warm, familiar light, with excellent rendering of colors. 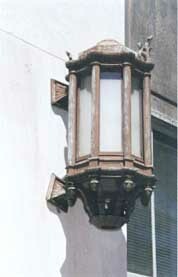 It is, however, expensive to run and more expensive to maintain as the lamps need to be frequently replaced. Metal halide, by contrast, is a more energy efficient source and one with more modest maintenance requirements. Formerly, it cast a greenish glare, but with recent corrections in its ability to produce the full spectrum of light, it has found more frequent employment in important spaces. The savings in energy and labor offered by metal halide over time will be substantial, but they must be balanced against the initial cost of adapting the fixtures to the new light source. New mount locations will be required and, since it requires a separate ballast, additional wiring chases, internal shelving and maintenance access as well. No upgrade specification for these fixtures can be considered reliable until it has been demonstrated and approved under field conditions. This can require construction of a demonstration mockup as every light source has its own physical configuration and characteristic way of distributing light, both of which need to be evaluated in terms of the existing historic fixture. Such preparation may seem tedious but it is the most efficient way to develop a design that effectively addresses all client interests. INSIDE, OUTSIDE, EVERYWHERE I GO, IT RAINS. Gas jets alight, a 1813 City Hall Park lamp awaits its turn in the “storm machine” at Aurora Lampworks’ Brooklyn studio where it will have a chance to demonstrate its ability to keep burning in all weather. Note beveled glass and cast finial, weighty and problematic aftermarket additions to the original work. The long and varied career of the lampposts in City Hall Park in New York illustrates how the interplay of lighting constituencies and evolving tastes for light can force a redesign even without any obvious technology upgrade. Four fixture heads dating from 1813, they were originally gas, then electrified at the turn of the 20th century, changed to high pressure sodium in the 60’s, metal halide in the 80’s and then back to gas in the year 2000. The current gas conversion was lodged in the original soldered sheet metal housing which itself was retrofitted with new heavy beveled glazing and an eight pound finial eagle cast out of bronze. To insure the gas flame was visible amidst high levels of background light in the Park, three gas jets were specified where, it was suspected, there had originally only been one. With the added weight of the new design elements and the suspected additional heat of the gas jets, the solder joints began to fail and the lamp housings collapsed. It would appear that an unintended accumulation of factors such as the weight of the design retrofit, a decision to restore a historical light source and the need to compete with modern levels of background light combined to overwhelm the stability of the original design. A new design was required that could safely support these elements while maintaining the existing look and fabric. Aurora rebuilt the fixtures around a steel armature capable of supporting the weight of the additional design elements and equipped them with concealed vents sufficient to prevent overheating. There was no change in the light source, but since the venting detail was unproven, Aurora tested the design in their in-shop “storm machine”, an assembly of fans and spray nozzles, to confirm its ability to maintain the gas flame in wind driven rain. With a tested design, the fixtures in City Hall Park are now well matched to their light source. Durable historic buildings are best served by a durable lighting design but the principles for developing such specifications are not universally understood. Aurora Lampworks believes that the field would benefit if established standards for the performance of restored lighting fixtures were to find wider distribution. Until they do, clients are advised to consider whether language such as “restore, as necessary” or “upgrade, making alterations as necessary” completely address all their potential concerns. Lighting restoration is only in part the restoration of artifacts. The recommendations of the conservator (see Conservator’s Toolbox) are not the end of the design process but often just the beginning. List of Lighting Restoration Specialists. This entry was posted in Lighting Restoration and tagged New York. Bookmark the permalink.